Les Misérables is a French historical novel by Victor Hugo, first published in 1862, that is considered one of the greatest novels of the 19th century Beginning in 1815 and culminating in the 1832 June Rebellion in Paris, the novel follows the lives and interactions of several characters, focusing on the struggles of ex-convict Jean Valjean and his experience of redemption. The scope and depth of the story is UNBELIEVABLE. The characters are so completely flesh and bone that you know them. You know who they are and exactly how they will react in a situation before it ever happens. The scenes are so masterfully laid out that you can envision every detail in your mind. And oh, believe me when I say the storytelling is breathtaking. 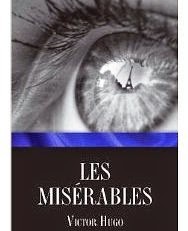 Les Miserables is about poverty and the human condition, set against the backdrop of decades of French history. But it is so much more. It's a story of the redemption of man, despite everything the world can throw at him. It is a story of fear and sadness, but most of all, hope. The hope that we can do better. The hope that religion will not lead us down a path of self-righteousness, but to true righteousness, which to quote the book of Isaiah is "to loose the chains of injustice and untie the cords of the yoke, to set the oppressed free and break every yoke". There is so much to be learned about forgiveness, love, happiness, and life from this story.